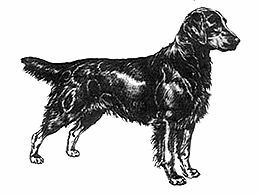 A bright, active dog of medium size with an intelligent expression, showing power without lumber, and raciness, without weediness. Head, long and nicely moulded. Skull, flat and moderately broad with a slight stop between eyes, in no way accentuated, avoiding a down or dish-faced appearance. Nose of good size, with open nostrils. Jaws long and strong, capable of carrying a hare or pheasant. Medium size, dark brown or hazel, with a very intelligent expression (a round prominent eye highly undesirable.) Not obliquely placed. Small and well set on, close to side of head. Jaws strong with a perfect, regular and complete scissor bite, i.e. Upper teeth closely overlapping the lower teeth and set square to the jaws. Teeth sound and strong. Chest, deep and fairly broad, with well defined brisket, on which elbows should move cleanly and evenly. Forelegs straight, with bone of good quality throughout. Foreribs fairly flat. Body, well ribbed-up showing a gradual spring and well arched in centre but rather lighter towards quarters. Loin short and square. Open couplings highly undesirable. Muscular. Moderate bend of stifle and hock, latter well let down. Should stand true all round. Cowhocks highly undesirable. Round and strong with toes close and well arched. Soles thick and strong. Dense, of fine to medium texture and good quality, as flat as possible. Legs and tail well feathered. Full furnishings on maturity complete the elegance of a good dog.